On Jan. 19, 2019, just 161 days after its launch from Cape Canaveral Air Force Station in Florida, NASA's Parker Solar Probe completed its first orbit of the Sun, reaching the point in its orbit farthest from our star, called aphelion. 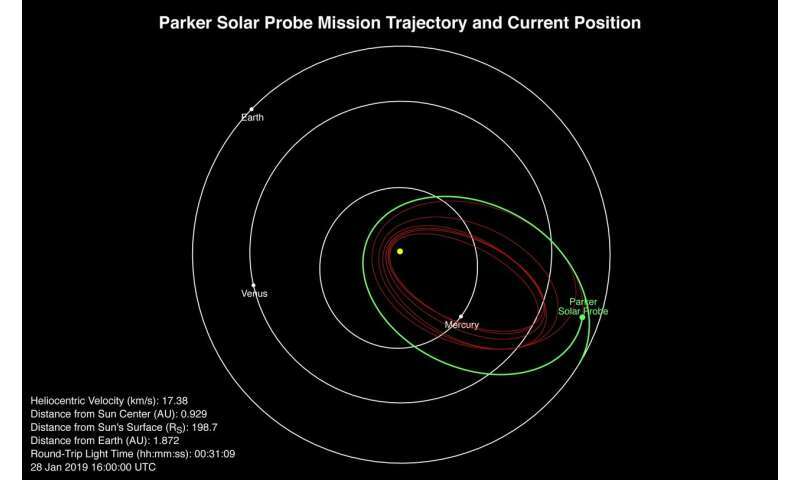 The spacecraft has now begun the second of 24 planned orbits, on track for its second perihelion, or closest approach to the Sun, on April 4, 2019. "It's been an illuminating and fascinating first orbit," said Parker Solar Probe Project Manager Andy Driesman, of the Johns Hopkins University Applied Physics Laboratory. "We've learned a lot about how the spacecraft operates and reacts to the solar environment, and I'm proud to say the team's projections have been very accurate." APL designed, built, and manages the mission for NASA. "We've always said that we don't know what to expect until we look at the data," said Project Scientist Nour Raouafi, also of APL. "The data we have received hints at many new things that we've not seen before and at potential new discoveries. Parker Solar Probe is delivering on the mission's promise of revealing the mysteries of our Sun." In preparation for that next encounter, the spacecraft's solid state recorder is being emptied of files that have already been delivered to Earth. In addition, the spacecraft is receiving updated positional and navigation information (called ephemeris) and is being loaded with a new automated command sequence, which contains about one month's worth of instructions. Like the mission's first perihelion in November 2018, Parker Solar Probe's second perihelion in April will bring the spacecraft to a distance of about 15 million miles from the Sun – just over half the previous close solar approach record of about 27 million miles set by Helios 2 in 1976. The spacecraft's four instrument suites will help scientists begin to answer outstanding questions about the Sun's fundamental physics—including how particles and solar material are accelerated out into space at such high speeds and why the Sun's atmosphere, the corona, is so much hotter than the surface below.